1Shiraz Burn Research Center, Division of Plastic and Reconstructive Surgery Department of Surgery, Shiraz University of Medical Sciences, Shiraz, Iran. *Address correspondence and reprints request to: Shiraz Burn Research Center, Ghotbedin Burn Hospital, Fakhrabad street, Shiraz, Iran, Postal Code: 71638-54733. Imani MT, Mohammadi AA, Jafari SMS. Spontaneous Fracture of the Humerus 18 Months after a High Voltage Electrical Injury: A Case Report. Oman Med J 2014 Mar; 29(2). Electrical burn occurs when a current passes through the body, interfering with the function of internal organs or sometimes burning tissue. Four major mechanisms of electricity-induced injuries are presently known. In this case report, a 29-year-old farmer sustained electrical trauma to extremities from a high voltage transformer, followed by a major, deep burn wound on upper lateral aspect of his left arm, and a deep burn wound over the left medial ankle. After a few months, the patient developed left arm fracture with complete separation of two segments, and plantar wound with purulent discharge accompanied by complete destruction of the head of 4th metatarsal bone which was in favor of chronic osteomyelitis. In this case, passage of the high voltage current and direct trauma could destroy metaphyseal, medullary and periosteal blood supply. Patients with high voltage electrical-induced bone injuries who underwent reconstructive surgery seem to be susceptible to osteonecrosis and pathologic fractures; therefor, these patients should be under close follow-up and periodic radiologic evaluations may be recommended. Keywords: Burn; Electrical injury; Spontaneous fracture. The discovery of electricity resulted into the promotion of industries, but led to deadly complications.1 The percentage of electrical burns varies from 3.2% in Eastern Asia to 21% in Turkey.2,3 Electrical burns occur when a current passes through the body, interfering with the function of internal organs or sometimes burning tissue.4 Low voltage injuries, caused by voltage less than 1000V, includes most injures caused by household current. High voltage, result of exposure to 1000V or more, is often resulting from occupational exposure to outside power lines. Lightening injuries involve energy with high voltage and amperage but short duration.4 Four major mechanisms of electricity induced injuries are presently known. Electrical energy can directly cause intense muscular contraction, asystole and/or apnea.5 Conversion of electrical energy into thermal energy, which can only be on the surface or may extend deep into the tissues, can cause massive tissue destruction and coagulative necrosis. On March 20, 2009, a 29-year-old farmer sustained electrical trauma to extremities from a high voltage transformer, followed by falling down from electrical post. The patient had an exit 4th degree burn wound, 25 × 15 cm, on upper lateral aspect of left arm with necrotic tissue and exposed burned-cortex humerus (entrance wound), and a deep wound over left medial ankle with bilateral full-thickness plantar burns (exit wounds). On the way to hospital, the patient lost consciousness and became hemodynamically unstable. At the hospital, due to bilateral pneumothorax, chest tubes were inserted, and with suspicion of internal bleeding, exploratory laparotomy was done for the patient. After splenectomy and IVC repair, he was transferred to the ICU for a couple of days. During the immediate resuscitation, the patient underwent fasciotomy of left forearm for compartment syndrome decompression. By taking different X-rays, possible fractures were ruled out. Subsequently, the patient again was taken to the operating room where debridement of the left arm wound and the burned cortex of humerus was performed. The defect was covered by latissimus dorsi musculocutaneous island flap. Eighteen days later, the left ankle defect was reconstructed by reverse sural flap, and both plantar wounds were covered by split-thickness skin graft. He was discharged from hospital 45 days after admission to the Plastic Surgery ward. 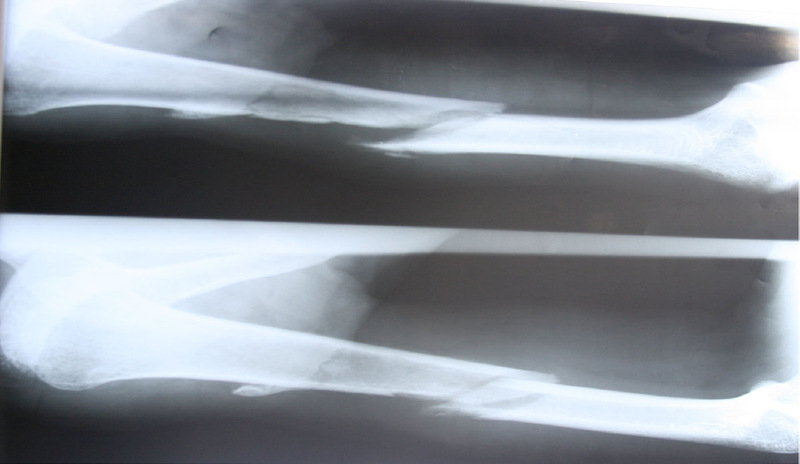 Figure 1: Humerus Fracture- 18 months after primary trauma. Figure 2: Follow-up figure which shows complete healing. 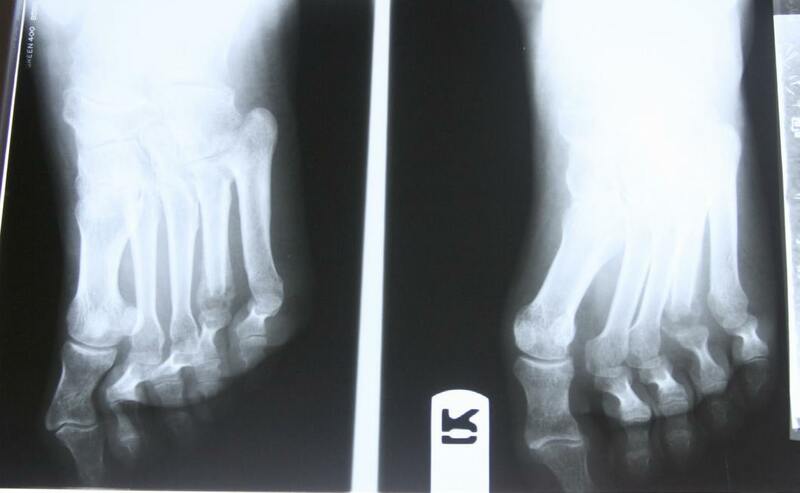 Figure 3: Foot roentgenogram which shows chronic osteomyelitis of the head of 4th metatarsal bone. 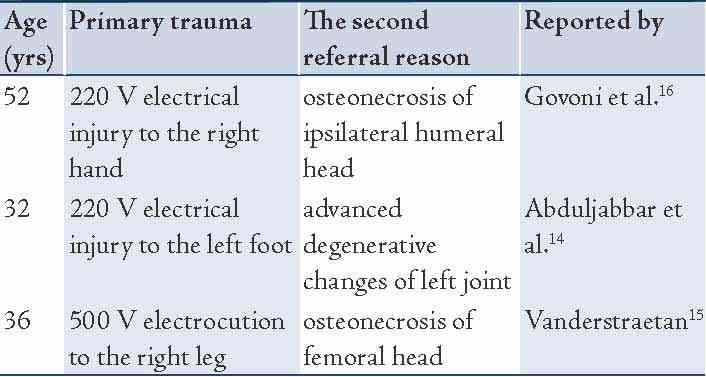 Table 1: Previous osteonecrosis cases following electrical trauma. In this case, passage of the high voltage current and direct trauma could destroy metaphyseal and medullary blood supply. Also, debridement of cortex and stripping of the periosteum can damage the periosteal system, the most significant source of blood supply during the early stages of fracture or bone repair.17 This possible process could be attributed to ischemia to the humerus and subsequent osteonecrosis, which could have made the patient in this case prone to the pathologic fracture 18 months later. The patients who sustained high voltage, 4th degree electrical bone injuries and underwent reconstructive surgery seem to be susceptible to osteonecrosis and pathologic fractures, therefore, these patients should be under close follow-up, and periodic radiologic evaluations may be recommended. 1. Mohammadi AA, Amini M, Mehrabani D, Kiani Z, Seddigh A. A survey on 30 months electrical burns in Shiraz University of Medical Sciences Burn Hospital. Burns 2008 Feb;34(1):111-113. Published online 6 Jul 2007. 2. Cheng PT, Lee CE, Yang JY. Electrical injury–clinical report of 67 cases. Changgeng Yi Xue Za Zhi 1994 Sep;17(3):220-225. 3. Nursal TZ, Yildirim S, Tarim A, Caliskan K, Ezer A, Noyan T. Burns in southern Turkey: electrical burns remain a major problem. J Burn Care Rehabil 2003 Sep-Oct;24(5):309-314. 4. Dzhokic G, Jovchevska J, Dika A. Electrical Injuries: Etiology, Pathophysiology and Mechanism of Injury. Macedonian Journal of Medical Sciences. 2008 Dec;1(2):54-58 . 5. Robin A. Hurley, L. Anne Hayman,, Katherine H. Taber. Electrical Injury, Part I: Mechanisms. J Neuropsychiatry Clin Neurosci 21:3, Summer 2009:240-244. 7. Jain S, Bandi V. Electrical and lightning injuries. Crit Care Clin 1999 Apr;15(2):319-331. 8. Tan AH. Missed posterior fracture-dislocation of the humeral head following an electrocution injury to the arm. Singapore Med J 2005 Apr;46(4):189-192. 9. Gehlen JM, Hoofwijk AG. Femoral neck fracture after electrical shock injury. Eur J Trauma Emerg Surg 2010 Oct;36(5):491-493. 10. ten Duis HJ. Acute electrical burns. Semin Neurol 1995 Dec;15(4):381-386. 11. Rhinelander FW. The normal microcirculation of diaphyseal cortex and its response to fracture. J Bone Joint Surg Am 1968 Jun;50(4):784-800. 12. Trueta J. Blood supply and the rate of healing of tibial fractures. Clin Orthop Relat Res 1974 Nov-Dec;(105):11-26. 13. Trueta J. The role of vessels in osteogenesis. J Bone Joint Surg Br 1963;45:402-418. 14. Fahad H. Abduljabbar,Mohammed J. Al-Sayyad.Osteonecrosis of the Femoral Head Triggered by an Electrical Injury.JKAU: Med. Sci., Vol. 16 No.3, pp: 93-98. 15. Vanderstraeten L, Binns M. Osteonecrosis of the femoral head following an electrical injury to the leg. J Bone Joint Surg Br 2008 Aug;90(8):1101-1104. 16. Govoni M, Orzincolo C, Bigoni M, Feggi L, Pareschi PL, Trotta F. Humeral head osteonecrosis caused by electrical injury: a case report. J Emerg Med 1993 Jan-Feb;11(1):17-21. 17. Rhinelander FW. Tibial blood supply in relation to fracture healing. Clin Orthop Relat Res 1974 Nov-Dec;(105):34-81.